Compatible with the full range of welding laser sources at powers from 150 to 8,000W, the multi-axis workstation demonstrated by IPG Photonics at this year’s Southern Manufacturing show is a Class 1 laser system that is particularly well-suited to dis-similar joining applications such as battery, bus bar, electronic components and batches of mechanical parts. Side panels can be removed for increased automated part feeds. A working envelope of 500 x 300 x 300mm is available for tooling. Up to five-axis operation is possible together with a range of standard options such as vision and power measurement. The system may be configured to order for a number of specific fibre laser processing applications. When fitted with a low cost, high brightness single mode YLR-150-QCW laser, the system is very well suited to fine welding of similar and dissimilar materials. Fitting a multi kW laser enables the system to automatically run deeper keyhole welding applications. Specifying a ‘wobble’ welding-head, further opens up the range of joining applications and materials, advises the company. 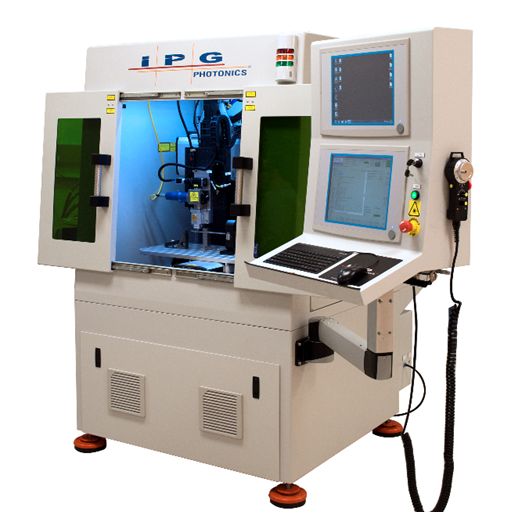 A range of cutting and welding systems, including fibre lasers, process heads and motion systems are available from the company which has experience in customising workstations for high volume manufacturing applications.